After all those years since the spread of Metal throughout the world on the first half of the 80’s, when many bands took the world by assault, there were many bets of names that could be great as BLACK SABBATH, JUDAS PRIEST and others from the 70’s. Many fans put their bets on English trio RAVEN due the energy of their music and their ability to create songs that could be easily labeled as classics. But unfortunately, the band tried to be like the Hard/Glam Metal from USA on their times on Atlantic Records, because “Stay Hard” and “The Pack is Back” were bitter albums to be swallowed on those days, and this kind of mistake was something that could put you to lose all your credibility, and even getting back to their roots on “Mad” EP, the world wasn’t the same anymore, the things had change and their chance was thrown away. They are legends and have a cult status, and are still alive and kicking today, and now another live album of the band is released, “Screaming Murder Death from Above: Live in Aalborg”, recorded during a show on the trio at Aalborg, Denmark, on 2017. It’s a live album, but when the name of RAVEN is spoken on this kind of release, be sure: it’s a magical moment, and a great release. The trio energy during their shows is already known by the Metal fans, and it was caught in a wonderful way on this show. Be prepared, for the album mix songs from all their phases (including one from “Stay Hard” time, the hit “On and On”), and the crude energy of the band is untouched, as the listener will heard. Yes, the same old and good traditional Heavy Metal with some 70s’ Hard Rock influences is presented on this live album. The capitation of the show was done in a way that the band didn’t know about it, but it bears the energy and all those elements from a true live album (only two overdubs were done: on “Hell Patrol” due a string of John’s bass guitar broke up, and irregularities on microphones), so it’s 99% a live show. And there are no complains about the sound quality, because everything fits, and can be heard clearly. This is the first RAVEN’s release with the new drummer, Mike Heller (that plays on FEAR FACTORY as well), for Joe Hasselvander had a heart attack, and it ended his musical career. But the band sounds as a unit, solid as a rock, and savage as always, for songs as the new and wild “Destroy All Monsters”, along with the old classics as “Hell Patrol”, “All for One”, “Hung Drawn and Quartered”, “Rock Until You Drop” (where the public sings along the band in many moments, because it’s one of the most remarkable songs), “Faster Than the Speed of Light”, “On and On” (here in a heavier version) and “Crash Bang Wallop” will get you on your knees! 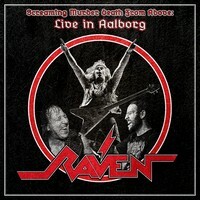 The last words of the review: it’s not a classic live album as “Live at the Inferno”, it could have more songs (maybe a triple CD live album would make justice), but with RAVEN commanding the agenda, you can bet your bucks on , “Screaming Murder Death from Above: Live in Aalborg”, because it’s truly a live album in the deeper meaning of the words. And thanks John, Mark and Mike for delivering one of the finest live albums from the last years.